I'm a Nail Dummy trying new nail art styles, come try along with me! Speaking about royal, out here in The Netherlands excitement is growing by the day as our current Queen Beatrix is stepping aside on April 30, to make way for her son Willem-Alexander. As I’m in Amsterdam, I’m already often bumping into cars from the royal family and staff, probably there to inspect the sites for the big day. I’ll be doing a special mani ready for this day consisting of the Dutch flag colours red, white, blue and royal colour orange, but long story short, all this royal talk got me in the mood for doing something in typical royal purple and gold. A very classy combination of colours indeed! At the same time, my sticky tape was looking at me as if it were saying ‘go on then, you know it’s time to do a real taped manicure?’. And yes, I did fancy practicing my taping skills, so here goes. I first used 2 coats of OPI ‘Purple with a Purpose’. I like how it’s a soft and not too dark shade of purple. After a good long wait I cut off 10 bits of tape, each long enough to cover the nail and a good 2 cm tip to make it easy to peel off, and stuck each of them on my hand first to reduce stickiness. You can really use any kind of clear sticky tape. Some would say Scotch tape works better, but I have quite cheap and basic tape from the supermarket and it works just fine. Then I randomly chose positions to stick the tape on. 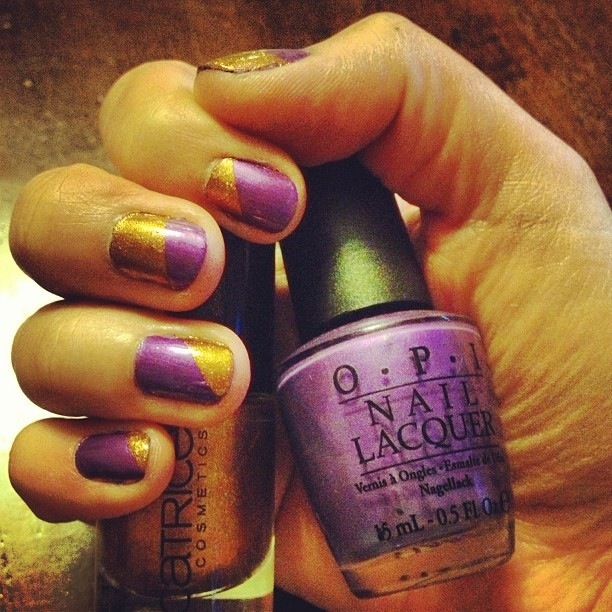 I liked the idea of having each nail having a different amount of purple and gold polish to make it a little more playful. Once the tape was in place, I painted it with just 1 coat of Catrice ‘Oh My Goldness!’. Love that name, by the way. It’s also very pigmented so with 1 coat the cover was already so good that I was ready to unveil the result. I slowly peeled off the tape sort of towards the gold polish to avoid smudging. Of course sometimes I did still smudge, which I fixed by either adding a little gold or camouflaging it with bits of purple. Also I fixed any corners missed with this same brush. After adding top coat you can’t really see any of your whoopsies anymore, so I’d say that this is a very dummy-proof manicure! Today's nails: in the navy! Today’s nails: who says nails can’t have a tan? Today’s nails: in the navy!